Have you ever imagined the ease of being able to control everything in just one click? The Sevenhugs Company had just made that idea turn into reality. 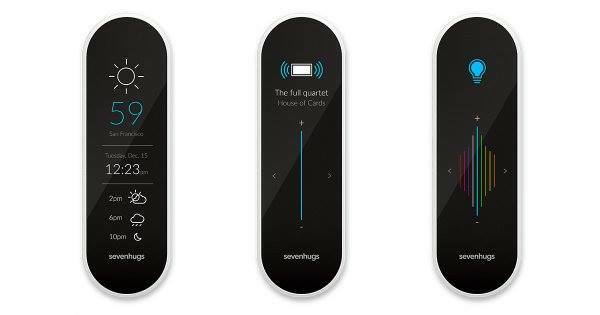 Sevenhugs developed a universal remote that can automatically configure itself to control whatever smart device you point it at. Aside from being able to control smart devices, it can also display a weather forecast when you point it at a window or even call an Uber when you point it at a door.The fundamentals in making this possible are the motion and indoor positioning sensors. Three sensors should be placed inside the room where the remote would be used. After doing so, the remote should be placed next to the smart device you want to control and push the “locate” button. According to Tchedikian, the remote is able to locate the devices within five to forty centimeters of precision. It can emit a locate tone whenever it is left in the wrong room. Although, it cannot locate the smart devices you already configured when it is in the wrong room.Right now, it works with over 25, 000 Wi-Fi, Bluetooth, and infrared devices. It is also made with an open application program interface so that it would be easy for the manufacturers to support the remote. It also comes with a software developer kit for the programmers that want to improve its features. The Sevenhugs Company plans to make the shipping of the product available in June 2017 which has the retail price of $299.Want to know more about this awesome device? Follow this link!